Your skin has tiny holes called pores, which can become blocked by excessive oil, bacteria, dead skin cells, dirt and products such as moisturisers, after shave balm and makeup. When this occurs, you may develop spots “zits.” If your skin is repeatedly affected by this condition, you may have acne. This may be also as a result of hormone levels, but can be made a lot worse by using the wrong products and an inadequate skin care routine. Acne is the most common of all skin conditions. Although acne isn’t a life-threatening condition, it can be painful, particularly when it’s severe. It can also cause emotional distress. Acne that appears on your face can impact your self-esteem and, over time, may cause permanent physical scarring. There are many effective Acne treatments that reduce both the number of spots you get and your chance of scarring. The following treatments for acne are less harsh on the skin than prescribed medicines such as Antibiotics and Reactine. As a single treatment or as a combination HydraFacial, Blue Light therapy and Skin Peels are a very effective natural solution to acne. 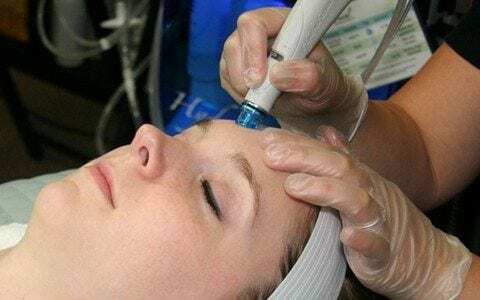 HydraFacial – is a non-invasive, non-surgical procedure that delivers instant results with no discomfort or downtime. The procedure is immediately effective. The acne treatment works by initially removing the impurities from your clogged pores and helping to restore skin health. Blue LED Light Therapy – has powerful anti-bacterial properties that decongest and purify problematic skin and can also help to normalise oil production. This treatment promotes calming and relaxation. Helps to kill bacteria in the skin and reduce active acne, prevents breakouts, and has a deep cleansing effect, shrinks enlarged pores, helps to fight infection and is a great alternative to medication. Skin Peels – Skin Peels are a pain-free method of treating various skin complaints such as the signs of ageing and acne.